William "Bill" Keith Nelsen, age 78, of Orlando, Florida passed away on Thursday, April 11, 2019. He is preceded in death by his parents, Andrew Jordan Nelsen and Madora Nelsen, and his brothers Andrew "Jordy" and Terrance "Terry J" Nelsen. Bill is survived by his wife, Vicki L. Nelsen; his sister, Mary Dominquez; his sons, William Keith Nelsen and Timothy Nelsen; his daughters, Missy Rothweiler, Tammy S. Riesz &Tracy L. Murray; 15 grandchildren; and 1 great granddaughter. A Celebration of Life will be held on Thursday, April 18, 2019 from 2:00 pm to 4:00 pm at Newcomer Cremations, Funerals & Receptions (East Orlando Chapel), 895 S. Goldenrod Rd, Orlando, FL 32822. To share your memories of Bill or leave a special condolence message for his family, please click the Share Memories button above. Add your memories to the guest book of William Nelsen. So sorry to hear of Bill's passing. Like a lot of boys growing up in the late 1960s, my brother Mike and I were fans of Bill and the Browns. It was because of Bill and teammates like Leroy Kelly that many of us became Browns fans. My brother and I followed the Browns even though we were growing up in northern New Jersey, home to the Browns' rival, the New York Giants. 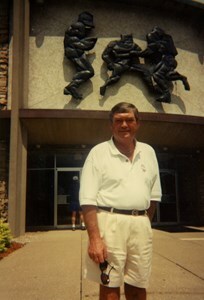 Bill and the Browns provided wonderful memories during those great years. I wish I had the pleasure of meeting Bill, but many of us still felt we knew him through the articles we read and the many times we watched Bill and the Browns on TV and listened to their games on the radio. I remember reading in 1970 that Bill's knees were in worse condition than even New York Jets QB Joe Namath's. Yet despite his painful injuries and career struggles, Bill's courage, toughness, and perseverance were examples of great character and served to inspire many young boys of that generation. We will always remember Bill fondly, and we pray that the love of God comforts his family and friends. I am so sorry for your loss. Sending so much love and positivity. You all are in my heart. Rest In Peace Bill. We will miss you! Even though I only knew him for a short time, I have so many happy memories with uncle Bill!!! When I first met him he was out I Cali for a USC football reunion. During that trip I was able to spend lots of time with him. I really enjoyed hearing stories about his time as a football player at USC, and beyond!! I only wish that I could have known longer, and heard many more stories! I will miss him so much, he holds a very special place in my heart! Bill was such a special man. I loved him like a father. I will never forget the pen name he had for me “little feet”. I will never forget him and am so honored that I knew him!! My prayers go out to Vickie and all of his children. Bill was such a sweet man. I'm so sorry to hear of his passing. Loving thoughts go out to his family.